I have stayed before at Rock Rim and Dogwood Cabins, but this cabin’s front porch with the whimsical railing created by a local artisan and the scenic view promoted a lot of front porch sittin and day dreaming. Rose Hammitt and I were part of a travel writers group invited to tour Hardin County and beyond in the Shawnee National Forest area where the cabin sits in the center of. We arrive a bit early in the day and had some down time before everything got rolling. The day was a bit cool for late April, so I took one of the extra blankets from the cabin, wrapped up in it and rocked on the porch swing between reading and dozing. With the breeze blowing by and the Guinea flock cackling in the distance it was an idyllic hour or two spent lollygagging. Rose and I had a wonderful stay at Eagle Retreat. The cabin offered a screened in back porch, lots of sleeping areas in the bedroom downstairs and in the loft area. The kitchen and all was quite accommodating, but I have to admit, it was the front porch and that swing that I fell in love with! 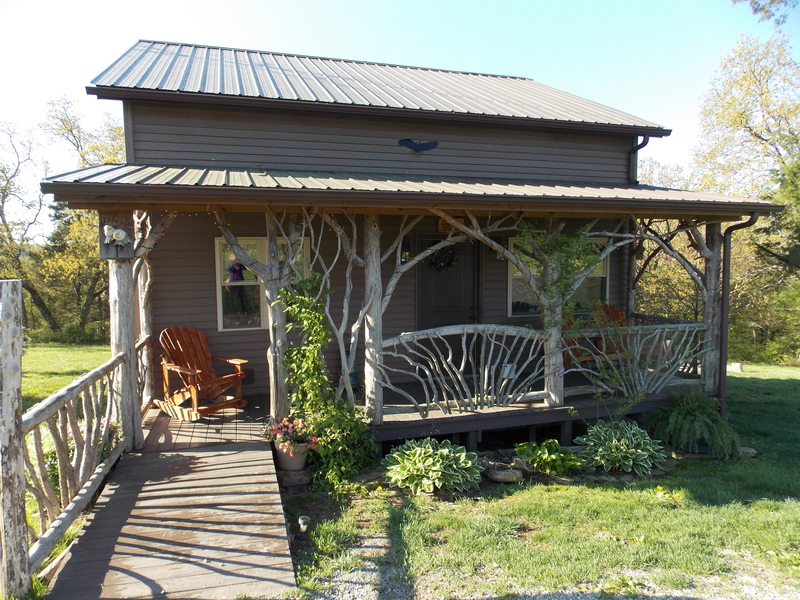 If heading Shawnee way, log onto http://www.rimrocksdogwoodcabins.com/ to check for availability! Previous Post: Garden of the Gods, a holy place indeed.